I love this brand..I just wish it was a bit cheaper or a lot cheaper. 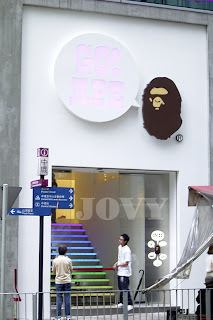 "A Bathing Ape, or Bape, is a Japanese clothing company specializing in urban streetwear. Bape's main focus is on clothing and the company produces a variety of clothing items, including but not limited to: shirts, polos, sweatshirts, parkas, jackets, denim, and most notably, the "Bape Sta," a shoe very closely resembling the Nike Air Force One. The company was started in 1993 by Nigo as a T-shirt brand, originating in the Harajuku area of Tokyo, becoming one of the first Japanese streetwear brands. The brand was launched out of a tiny Harajuku storefront called "BUSY WORKSHOP". Bape's logo and themes are derived from the original Planet of the Apes movies, while the brand's name is based on a common Japanese saying, "bathing in lukewarm water", describing the comfortable lifestyle of today's youth in Japan." Pic. 1: Nigo, the founder of A Bathing Ape. Pic. 2: Outside the Babe shop in Hong Kong. I have actually been there. It was so weird cause they had guards outside making sure there were not too many people in at the same time. They just let like 10 people be inside at the same time and that place was HUGE. It looked like a gallery. Pic. 3: This is inside the shop. I don't think we were allowed to take pictures but we did it anyway.